Georgetown University’s Asian American Student Association invites you to our second annual Asian Diversity Dialogue! This year, ADD’s theme is “Across the Industries." 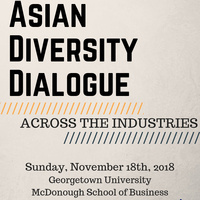 Held at Georgetown University’s McDonough School of Business, the conference will highlight the importance of diverse industries which are sometimes overlooked in Asian and Asian American communities. Come and connect with Asian American and Pacific Islander students and professionals through a full day of networking and panelist events. Speakers this year will include professionals in law, healthcare, and consulting, so be sure to get your tickets now! NOTE: This event is not limited to API students and everyone is welcome to attend. Come join us! Lunch and bubble tea will be provided too.